How Much Money Do You Save From Energy-Saving Light Bulbs? Trading an incandescent for a CFL bulb can save you up to $40 in its lifetime. 1. Will I Save Money on Electric Heating Bills by Installing a Heat Pump? 3. How Much Money Can Owning an Electric Car Save You? A traditional incandescent light bulb is great for lighting up your home, but because of its nature, wastes between 90 and 98 percent of its energy usage as heat. Energy-efficient bulbs are designed to operate more effectively, using a higher portion of their energy consumption to make light. Because of this, compact fluorescent and halogen lights can help cut your energy bill, but determining how much you’ll save depends upon the type of bulb you replace, your new bulb and your energy cost. The average household spends about $264 each year on electricity for lighting, according to MSN. Because incandescent bulbs are so inefficient, much of that consumption is converted to heat and wasted. On average, compact fluorescent light bulbs operate about 75 percent more efficiently than an equally bright incandescent, so replacing a house full of incandescent bulbs with CFL bulbs reduces energy consumption by 75 percent. In an average home, that’s the equivalent of $198 in savings annually. If electricity costs $0.08 per kilowatt hour and you operate a 75-watt incandescent bulb for six hours a day, it consumes 164,250 watts, or 164 kilowatt hours, in a year, resulting in energy costs of about $13.12 annually. A 20-watt CFL bulb produces the same amount of light, according to The Daily Green, and only consumes 43,800 watts, or 43 kilowatt hours, during the same operational period, at a cost of $3.44. So switching out a single bulb may result in savings of nearly $10 each year per bulb, although savings hinge upon the cost of electricity in your area. 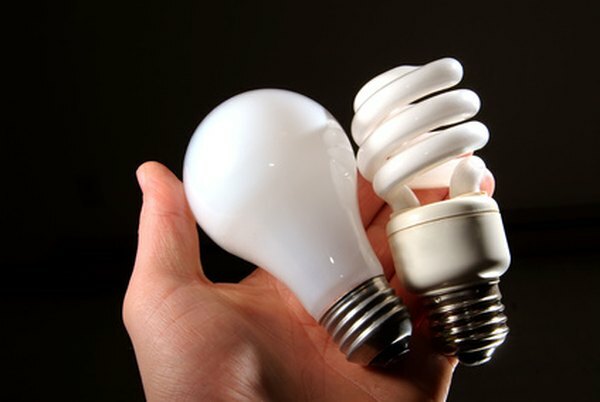 The average CFL bulb has a much longer lifespan than an incandescent light bulb. Bulbs that are energy star certified last at least six times as long as a traditional incandescent lamp. At today’s average electricity rates, you can expect a CFL bulb to save you about $40 in energy savings before it burns out, according to the U.S. Environmental Protection Agency. They also produce 75 percent less heat, which can reduce cooling costs in homes as well. The price of a CFL bulb may seem steep in comparison to incandescent bulbs, although you’ll save money in the cost of replacement bulbs in the long term with CFL bulbs, too. The average incandescent bulb lasts for about 1,000 hours of use, while many CFLs produce light for 10,000 hours, according to MSN. Because of this, if you purchase a single CFL for $4, it replaces 10 incandescent bulbs that, at $0.75 each, would cost $7.50. MSN Real Estate: Energy-Efficient Light Bulbs - How Much Do You Really Save? What Is a Gas Guzzler Tax?